As an existing E-safety Support member, you will already know about the fantastic range of resources that are available as part of your membership. But now you could have access to even more. If your school would benefit from classroom resources, parental guidance, advice for staff, checklists, policies and staff training on a range of safeguarding topics, upgrade from E-safety Support to Safeguarding Essentials now! Topics include abuse, bullying, FGM, mental well-being, drugs and alcohol. Our Safeguarding Essentials service allows teachers to have the latest knowledge at their fingertips to deliver outstanding safeguarding practices with ease. 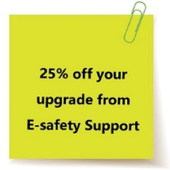 To claim you discount, email kristi@safeguardingessentials.com quoting promo code ESS25 for your unique upgrade package or call us on 0113 360 7838.